Orgill: Order by Wednesday 5:00 PM for Friday Store Pick Up or shipped to you. Use to remove old finishes, (most stains, lacquers, and protective finishes) without harming the original surface, or to clean and remove rust from metal surfaces. 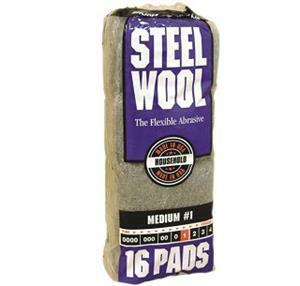 Steel wool is a very versatile material and can be used for a variety of household, remodeling and construction tasks. Homax Steel Wool, Medium, Grade #1 is made of uniform, high quality metal strands. Use Homax steel wool for cleaning, polishing, buffing and refinishing. It's perfect choice for do-it-yourselfers and professional contractors. Grade #1 Medium Steel Wool has uniform, high quality metal strands that offer gentle abrasiveness. Flexible to reach in and around corners, it cleans metal tools, instruments, windows and glass.